A great summer tomato should drip with juice, burst with sweet-tart flavor, and shame the supermarket specimens sold during the cold months. “Winter tomatoes are often picked green and may be ripened artificially with ethylene gas,” says Barry Estabrook, author of Tomatoland. That makes a difference — a Spanish study found that vine-ripened tomatoes are higher in lycopene, vitamin C, and total phenols and flavonoids than tomatoes that were picked green. 1. Spread the medium red and small yellow tomatoes on a big platter. Sprinkle them with 2 Tbsp olive oil, 1 Tbsp vinegar, 1/4 tsp salt, and 1/8 tsp pepper. Let them sit for 30 minutes. 2. In a large bowl, combine the cherry tomatoes, sweet-onion rings, basil, mint, and parsley. Toss with 1/3 cup olive oil, 1 Tbsp vinegar, 1/2 tsp salt, and 1/4 tsp pepper. 3. Divide the marinated tomatoes among four plates. Top them with the cherry tomato salad, dividing it evenly. With a spoon, dab the burrata over and around the salads. Crack some black pepper over each plate and sprinkle sea salt over the cheese; serve. A quick trip to the saute pan blunts the acidity of tomatoes, allowing their sweetness to fully come through. And your body benefits: An Australian study found that cooking tomatoes with olive oil can dramatically increase the bioavailability of the fruit’s lycopene. (Your body can absorb more of it.) They need only a few minutes of cooking: “Summer tomatoes are so ripe that they hit the pan and immediately begin melting into a sauce,” says Feinberg. An avowed pasta freak, Feinberg recognizes that a recipe like this one seems almost too simple to be special, but the proof is in the eating. “It’s fantastic to make at the height of tomato season. A perfect dish,” he says. 1. In a very large skillet, warm the oil over medium-high heat. Add the garlic and cook until fragrant, about 2 minutes. Add the tomatoes and cook until most of the liquid evaporates, about 5 minutes. Add 2 Tbsp water to the pan. Remove from the heat. 2. In a large pot of well-salted boiling water, cook the pasta until it’s 2 minutes shy of al dente; drain. 3. Toss the pasta into the pan with the tomatoes. Add butter and basil and cook over medium until the pasta is just al dente, 1 to 2 minutes. Toss in the Parmesan and season with salt, adding more water if the sauce is dry. Serve with a drizzle of oil and more cheese. Need some healthy testosterone-foody suggestions? Try these: 40 Foods with Superpowers. Hint: Tomatoes are one of them! Post by Daily Health Tips. There’s no better reason to turn on your oven in summer. 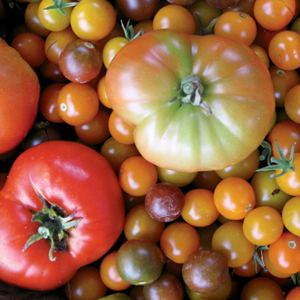 “Roasting is a great way to coax deep, earthy flavor out of tomatoes,” Feinberg says. “In essence, you’re almost dehydrating them, evaporating some of their water so the sweetness intensifies.” The tomatoes will burst but retain some of their juice, leaving you with what Feinberg calls “little flavor bombs.” The nutritional profile is impressive: An Italian study found that cooking cherry tomatoes increased the bioavailability of their naringenin and chlorogenic acid, two potent antioxidants. Pile this roasted-tomato mixture on crostini, or cover it with olive oil and keep it in the fridge to toss into pasta, omelets, or sandwiches. 1. Preheat the oven to 250°F. Toss the tomatoes with 1/4 cup oil and 1/4 tsp kosher salt. Spread them on a baking sheet; they should just fit on the sheet without overcrowding it. Roast for 2 hours. Reduce the heat to 200°F and roast 1 1/2 hours longer. Cool the tomatoes completely and transfer them, along with the oil from the pan, to a bowl. 2. Meanwhile, grill the bell pepper (or char it over a gas flame) until blackened. Place it in a deep bowl and cover the bowl for 10 minutes. Scrape off the blackened skin and remove the seeds. Add the pepper flesh to a bowl with 1 thinly sliced garlic clove, the vinegar, and the oregano. Season with salt and pepper; then pour enough oil over the bell pepper to cover it halfway. Cover with plastic and marinate 2 hours. 3. Preheat the broiler. Brush one side of the bread slices with oil and toast them, oiled side up, until golden and crisp, about 1 minute. Rub them with the remaining garlic clove. 4. Season the reserved tomatoes with the basil. Lay the peppers on the crostini and pile the tomatoes on top of the peppers. Finish each toast with an anchovy and season it with sea salt and pepper. Finally, drizzle on some of the roasted-tomato oil.